So said Rudy Wiebe, a leading Canadian novelist, who is headlining the 2nd annual ‘Many Strands: Celebrating the Art of Storytelling,’ May 29 and 30 at MEI Middle School in Abbotsford. The conference is not being called a Christian event, but the organizers and presenters are generally Christians and approach their work from that perspective. A case in point is Wiebe’s A Discovery of Strangers, which he considers “a profoundly Christian story” – even though it is the pagan Dene natives who act in a more humane, caring and Christian way than the Christian English sailors who encounter them. It is ironic and somewhat disappointing to Wiebe that his novels have been readily accepted in secular universities and literary circles, but have often been less warmly received in Christian circles. 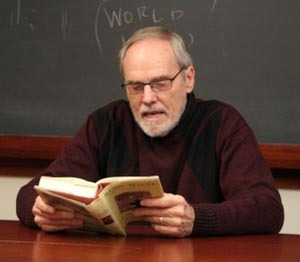 On the first evening of the conference, Wiebe will read from50 Years of Stories. His first short story was published in 1956. The conference will also feature other ‘strands’ of storytelling: cinematographer Jan Kiesser, author Marnie Wooding, balladeer Jonathan Michael, graphic designer Neil Klassen, writer Selma Turner, communications consultant Steve Rudy, children’s writer Donna Richards, and classical singer Sukainah Rahimtula.